One day this past summer, a Summer Program participant in need of help showed up to Samantha Marinello and Rachel Nordgren’s office hours. “He was trying to do this complicated thing with his own data. It was a question of fixing code,” says Nordgren, who was a teaching assistant, along with Marinello, for Longitudinal Analysis. The participant was clearly frustrated. Marinello and Nordgren worked with the participant until, finally, he got the program to run and produce output. To their surprise, he started cheering. In the library. “If your students are not excited and don’t care, it is so much harder to be enthusiastic yourself,” says Nordgren, a PhD student in biostatistics at the University of Illinois at Chicago. Prior to working at the Summer Program, she’d been a research assistant in her department, but never a TA. Teaching experience was a must, Nordgren’s advisor had informed her, if she intended to pursue a career in academia. Rather than be a TA in her department for a mandatory intro stats course, Nordgren applied for a “TAship” at the Summer Program, which she’d heard about from Michael Berbaum, a UIC professor with whom she’d conducted research. 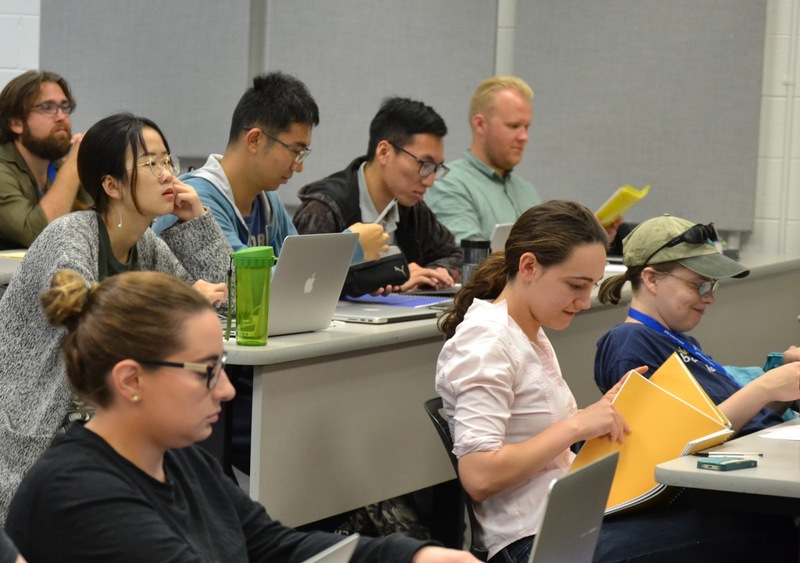 “This seemed like a cool way to actually have a chance to be with people who are motivated to learn, and get exposed to how social science thinks about stats,” Nordgren says. right) in the workshop "Longitudinal Analysis." This was also Marinello’s first time as a TA, although she’d had prior experience tutoring students. “I thought it would be a really good opportunity to teach, because you really have to know the material to be able to teach it,” she says. A PhD student in health policy at the University of Illinois at Chicago, Marinello was energized by her meetings with participants. “They asked really deep, very good questions, and on top of that, we got to know the students,” she says. “Outside of helping them with assignments or going over material with them in class, I got to talk to students who were applying to PhD programs.” She shared her experiences and knowledge about things like writing a statement of purpose and switching advisors. Marinello and Nordgren’s tireless efforts didn’t go unrecognized by participants. “They’d be excited about understanding something. They were so appreciative,” says Marinello.